Get latest Fairy Tail 330 Spoilers 「フェアリーテイル ネタバレ 第330話」 or Discussion at mangaspoiler.com. if you would like to discuss the Spoiler or prediction, please leave a comment below. Now how did I forget about that flame dragon? It all feels rush imo…it’s just wam-bam-done, nothing compelling. von why are you spamming? told 10,000 dragons to show up. 7 dragons show up. told dragon manipulation magic is absolute. atlas casually changes side. told 7 slayers vs. 7 dragons. 6 slayers vs. 6 dragons. next week, all the dragons and slayers become friends. f.lcuy’s journal turns out to be a fairy tale despite the morbid stuff she was clearly writing. rogue casually decides not to destroy the world and befriends acnologia.. that or mashima will throw in another person from the future. does this artist have any conviction to stick to a plot? he writes like he randomly wanders off into the forest for weeks then comes back with ideas. Not everything is going to go as initially planned or predicted. In no way has he strayed from the plot for having Atlas assist Natsu, or by having Lucy stop there from being 10,000 dragons, etc. Being swayed so easily despite the use of Dragon Manipulation Magic having been in effect was rather disappointing though. Atlas shouldn’t have been able to break free of control so easily. Its just full of disappointments. His may not have strayed from his ‘designated plot’ but he has swerved around all the hype he set us up for and I can only imagine he will keep doing it. Nice chapter overall, I suppose. More or less predicted Atlas assisting the slayers. Didn’t expect in this way, though. Looking forward towards the next. Hoping to see a little bit of what Lucy found from reading in her future diary. Any predictions as to what it may entail? What the chapter is out? oh I didn’t know Thanks. Btw why no new thread? 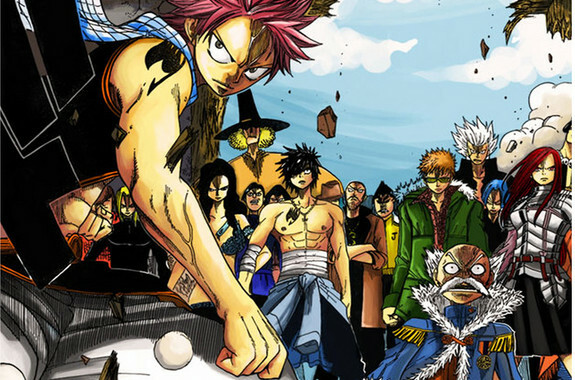 The admins may be dumping the Toriko and Fairy Tail sections, again. Great chapter. So there are kings of all elements.